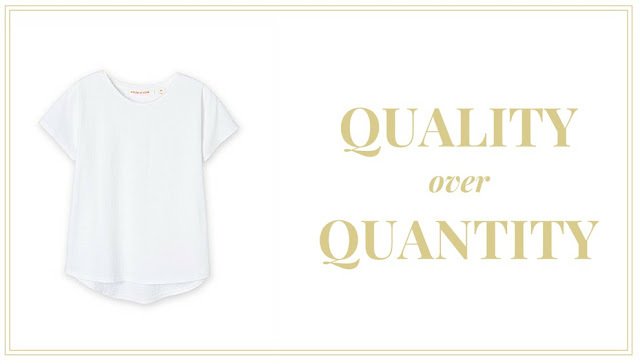 When do we decide when quality is greater than quantity or quantity is greater than quality? I think a lot of people would be able to answer this question pretty easy. But I think it comes down to what the item is and what works best for you at the time. Lets use a plain white tee as an example. This is a clothing item that I regard as a must have in my wardrobe, it's something that is extremely versatile when creating outfits. So, if you had the option of choosing a white tee from a department store for $5 or a more expensive labelled brand white tee for say $45, what would you choose? There are a few things to consider... who would of thought buying a shirt would be so dang serious? Kidding, just an example remember. These are the questions I need to ask myself, because not only am I trying to re-build what is in my closet but I myself am also on a strict budget. Do I want a few of the cheaper shirts, I know they aren't the best quality but I will have a few, so once one gets a bit gross looking I can move onto the next. Or, do I want the shirt that is much more expensive but is also higher in quality therefore I will not need to repurchase another for a long time. In this case, I'd choose quality over quantity. I definitely don't think this is the case every time though. Ladies like myself that I are on a budget, sometimes we have no choice but to get that the cheaper quality shirt. You know what though? We're going to rock the hell out of that shirt no matter which one we choose! Which one would you select and why?